Israeli soldiers kidnapped, on Friday at dawn, nine Palestinians different parts of the occupied West Bank, while one Palestinian was kidnapped, on Thursday evening, near Tulkarem. Several army vehicles invaded, approximately at 3 at dawn, the village of Douma, southeast of the northern West Bank district of Nablus, before breaking into and searching homes, and kidnapped two Palestinians, identified as Akram Hasan Dawabsha and Mahmoud Abdul-Fattah Salawda. Local sources in Douma said the soldiers caused power blackouts in some of the invaded homes, while violently searching them. The soldiers also invaded Huwwara town, south of Nablus, and imposed curfew allegedly after youngsters hurled stones on Israeli cars, driving on a nearby settlement road. Furthermore, Israeli soldiers stationed at the Za’tara roadblock, near Nablus, searched several cars, and kidnapped a young man, identified as Tareq al-Kiswani. In addition, several army vehicles invaded Ya’bad town, southwest of the northern West Bank city of Jenin, searched homes and kidnapped two Palestinians, identified as Ahmad Maslamani and his brother Soheib, both in their twenties. Most of the searched homes are located southwest of the town, and at it main entrance, media sources said. 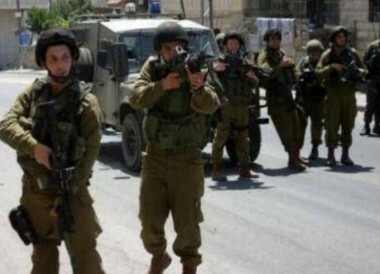 The soldiers also invaded Kafr Dan town, west of Jenin, searched and ransacked homes and kidnapped two Palestinians, identified as Amir Nasser Abu Zeid, 27, and Arqam Taiseer al-Jamal, 50. Eyewitnesses in the town said the soldiers smashed the front doors of some of the invaded homes, while the families slept and broke into them. In the northern West Bank district of Qalqilia, several military vehicles invaded Azzoun town, searched homes and kidnapped two Palestinians, identified as Yousef Rasheed Radwan, 18, and Anas Mahmoud Adwan, 17. In Bethlehem, the soldiers installed many roadblocks on various roads in the district, and blocked traffic for more than two hours. Media sources said the soldiers installed a roadblock in the Nashshash area, and searched many cars, reportedly after shots were fired from a speeding car, crossing the Etzion roadblock. On Thursday evening, soldiers stationed on the ‘Ennab military roadblock, west of Jenin, and kidnapped one Palestinian, identified as Yousef Zohdi Frehat. His family said the soldiers kidnapped him as he was heading back home from work at the Palestine Technical Institute (Kadoori). On Thursday at night, the soldiers invaded the home of Hussein Ali Mallah, in Beit Qad village, east of Jenin, and confiscated electric equipment, including a washing machine, TV, microwave and a fridge.